February 17, 2019 February 17, 2019 ~ Craig M.
The effect comes from rapid-fire shifts in time signatures — take a look at the blips of 13/16 and 15/16 in the sheet music for “Extra Sensory Perception Part II,” below (full score available here). Pianist Richard Harrold, guitarist Ant Law, and percussionist Richard Kass run this obstacle course with slick aggression, with Law’s eight-string guitar doubling as bass. The effect is like a sped-up minimalism, with lots of jump cuts between phrases that are repeating but not really repeating. The result is music that feels ultra-modern but still sounds pleasant, between the chiming jazz-club chords and the occasional acrid-but-friendly touch of guitar. 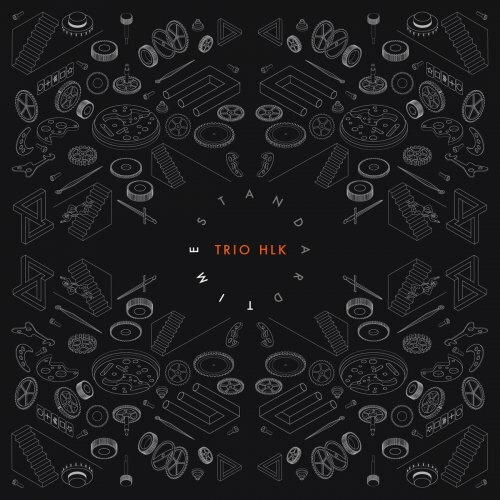 “TWILT,” a brainy twist on a jazz standard (you can figure out which one), is a good demonstration of what the trio can do. But their guest musicians add some sparkling fun. Lehman add his angular sense of cool to three tracks, and Glennie dances airily on songs like “Extra-Sensory Perception,” a thrill ride that culminates in a hard-driving succession of rising chords shared by piano and guitar. Here’s a video of the gentle Part I of “Extra-Sensory Perception,” followed by the more intense Part II.